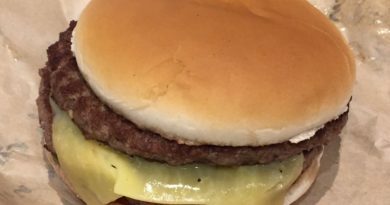 McDonald's Bacon Double Cheeseburger - Price, Review, Calories & More! 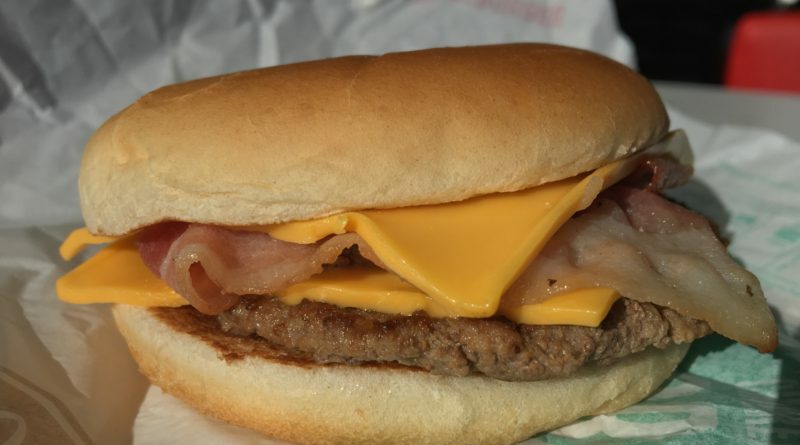 You won’t find a Bacon Double Cheeseburger on the McDonald’s website but you can now order one! 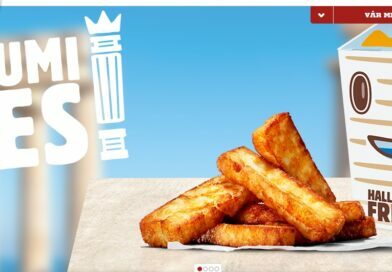 Since reporting on Add Your Twist, McDonald’s have now rolled out customisation to their touch screen ordering kiosks and Click & Collect mobile app. Can I order extra patties? Not currently. 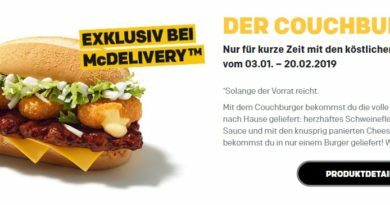 You can with breakfast – turn a Double Sausage & Egg McMuffin into a Quadruple but this option hasn’t made its way to the main menu as of writing. So what can you customise? 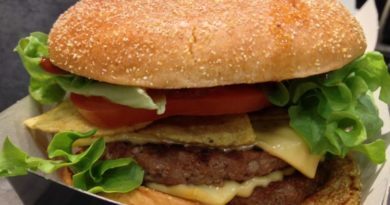 Well looking at the Click & Collect app you can remove or add to the following favourites; Big Mac, Quarter Pounder with Cheese, Cheeseburger etc – basically anything that is not a promo burger and/or Signature Collection. You have been able to remove ingredients for a while now, but adding is becoming more common. For example, on a Double Cheeseburger you can add Mayonnaise, Shredded Lettuce, Tomato or Bacon. Bacon? You mean I can FINALLY get a Bacon Double Cheeseburger at McDonald’s? Like the one at Burger King? Today I was going for two options; a) Double Cheeseburger with only pickles and onions plus bacon and b) Plain Double Cheeseburger plus bacon – as close to the BK version as you’ll get. Brilliant. I really loved it and actually option b) was far more enjoyable than option a). 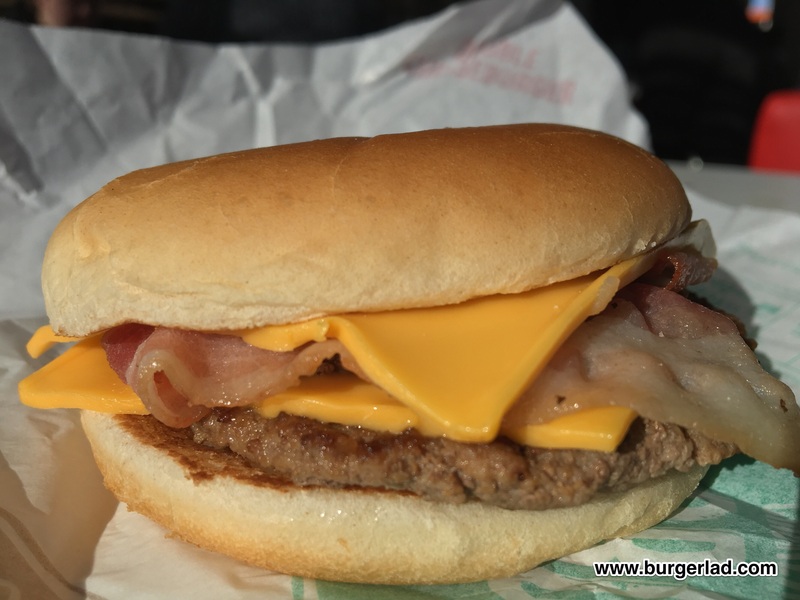 I have been toying with option c too – a standard Double Cheeseburger with bacon added. Maybe next time? If I can be bothered. My local-ish McD’s has just finished its upgrade and now you can take full advantage of Click & Collect etc. 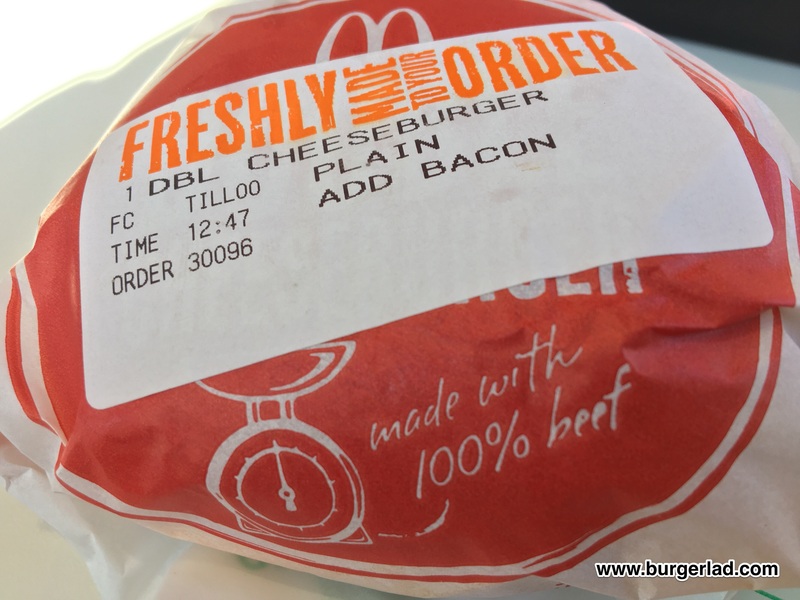 After a decent waiting time (it used to be ridiculously slow in here) I was presented with my Bacon Double Cheeseburgers. 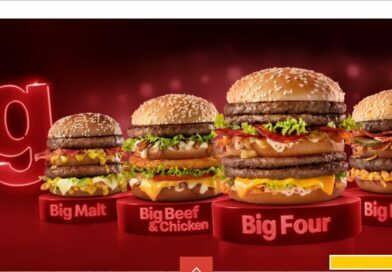 You’ll pay £1.89 for one of these at McDonald’s (last time I checked at BK this was more like £4). The pickles and onions version was pretty good. Definitely enjoyed it but something didn’t feel quite right – perhaps I should have had it with the ketchup and mustard after all. It’s the plain, plain one though that is the best. No sauce. No salad. Nothing but just bread, meat, cheese and bacon. Perfect. It is surprisingly similar to the BK version minus the fake flame-grilled flavouring. I’ll definitely be sampling another one. It doesn’t look a million dollars but what do you expect for a burger for just under two quid? 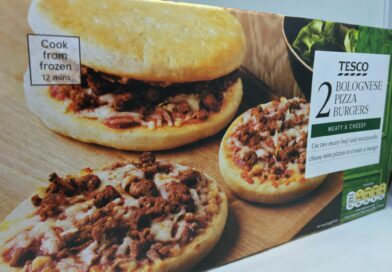 For your 40p extra you get two slices of Beechwood Smoked Bacon – mine did look a bit fatty in places to be honest, but didn’t detract from the enjoyment levels. You get that warming glow of the beef and cheese and then the smokiness of the bacon – it’s an obvious classic and one I will be re-visiting. Guaranteed. If you haven’t tried using the Click & Collect app yet I would strongly recommend it. I can do mine and my kids order at home and then just check in when we arrive in the restaurant. No queues, no touch screens, no stress. Just find a table and repeat order if you desire, all from the comfort of zone 1, 2 or 3 – all on your phone. Brilliant. As someone that has always been keen to remove certain offending items in the past, this is also desirable and IMO helps reduce mistakes. 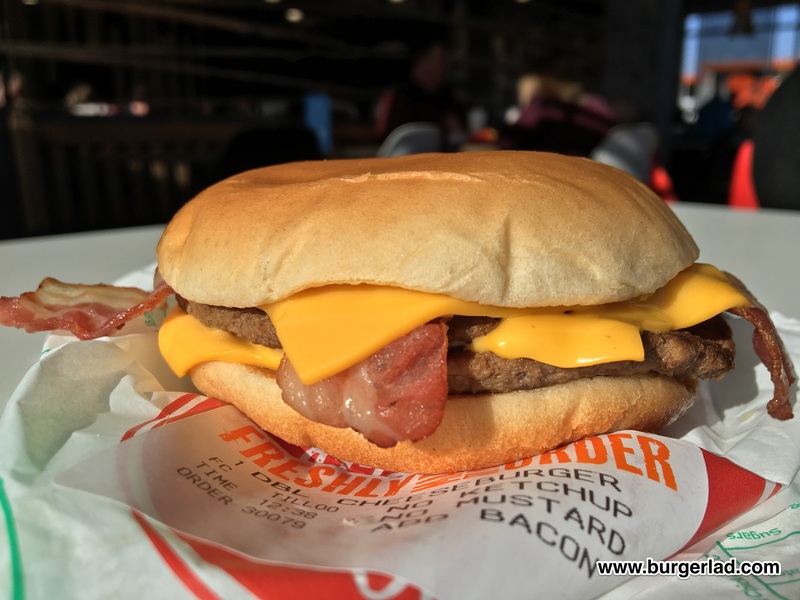 For many years, I was a massive fan of Burger King’s Bacon Double Cheeseburger just because it had no sauces or salads so it’s great to get my hands on a McDonald’s version. 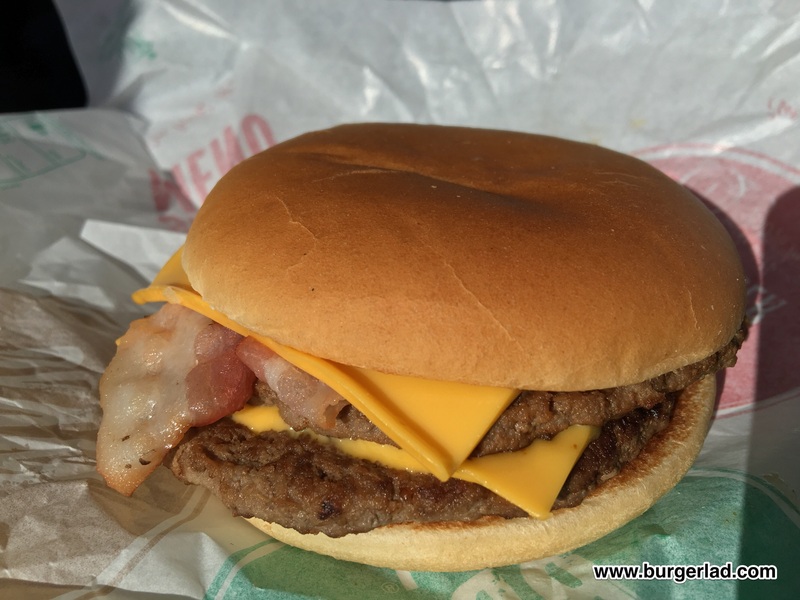 McDonald’s Bacon Double Cheeseburger is cheap and cheerful and definitely worth trying just once. Let us know how you customise yours! 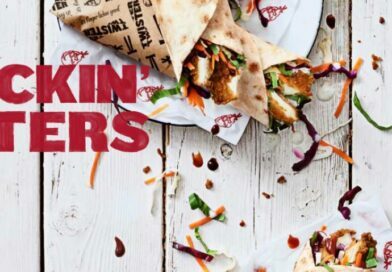 UPDATE: McDonald’s UK now offer this in limited restaurants and it is rumoured to join the full menu in 2019.